Bradley Kerl is a Houston, TX based painter interested in interpreting and describing the world around him through paint. He received his MFA from The University of Houston, and will be an artist-in-residence at Villa Lena in Italy during October 2018. Interview is between the artist, Bradley Kerl and Ty Bishop. Follow him on Instagram at @bradleykerl. Interview is published in Volume 7. TB: For starters, tell me about your journey as an artist. BK: I grew up in a very small town in southeast Texas. There wasn’t much to do, so my four siblings and I were encouraged to make our own fun. Thankfully, I had an older brother to look up to, and through him I was exposed to all sorts of things, including drawing. Although I was drawing from a very young age, I consider myself a bit of a late-bloomer when it comes to the art-related world. I wasn’t exposed to any art history or painting until the tail end of high school. I found out about “art school” from my high school art teacher and have been stubbornly, and maybe a bit naïvely, pursuing painting since then — first as a drawing and painting major at the University of North Texas, then as an MFA candidate at the University of Houston and now with my studio practice. During my time at UNT, I was also pretty intensely involved in the Denton music scene and had the opportunity to tour the US and Europe in a rock’n’roll band. That experience was very formative, naturally, but it didn’t really translate into becoming a better painter. After graduating from UNT in 2009, I effectively quit music and dedicated myself solely to painting. TB: I find your paintings wonderfully fresh. There’s a historic sensibility to them, yet they’re set in the now. Can you talk about some of the influences behind your work? BK: I’m incredibly indebted to the vast, diverse history of painting and the artists who have pushed the medium forward. I appreciate being able to draw upon that history while simultaneously questioning and even undermining it a bit so as not to take it all so seriously. I can engage with the romanticism of painting while remaining pragmatic about it. Similarly, working within established genres such as still-life, portraiture and landscape provides me with a starting point or baseline that is rooted in tradition to then build upon or subvert. I look equally at work from the greats and contemporary painters. I would consider Mamma Andersson, Pierre Bonnard, Peter Doig, David Hockney, Alex Katz, Henri Matisse and Fairfield Porter as my core forever obsessions. Although I’m equally enamored by basically the entire roster of artists represented by CANADA in New York; I strongly identify with the artists’ punk ethos and their radical approach to painting. TB: In your latest work, you depict flowers and plant life which you’ve worked with over the past several years. What interests you in this subject matter? BK: When I started working with this subject matter it was merely a means to an end –– I wanted to be a better painter, so I started painting things I had no idea how to tackle. I purposefully chose stock imagery that seemed innocuous and was common enough that anyone could recognize it. To avoid sentimentality or preciousness, I kept my subject matter as impersonal as possible. Over time, I began to notice that I was encountering similar images and moments in my daily life, and I have gradually shifted into making work about my day-to-day experiences. With the recent addition of two children, I might have become overly sentimental at this point. I think about my current paintings as portraits or time capsules of very specific times and places. TB: In your work between 2017 and 2018, there’s an emphasis on flattened forms. Is there any correlation between subject matter and how you paint? BK: My source material and preliminary studies have a big influence on how developed the larger, finished paintings end up. Sometimes I highly process an image — drawing from a photograph, then making a watercolor study from that drawing. Other paintings are derived directly from photographs. Basically, it comes down to how much information I choose to work with. It’s also a way in which I can poke at the illusion of depth on a flat, two-dimensional picture plane –– simultaneously affirming and negating it. TB: What do you think the purpose of art is? BK: Art can serve as many different purposes as there are people in the world. Personally, I think the purpose of art is to provoke a response. Ultimately it’s about eliciting a reaction between a work of art and a viewer. TB: Seeing your work digitally, I was surprised to find out how large some of your pieces actually are. Can you talk about how scale is significant for your work? BK: At any given time, I have 5 to 10 paintings in progress at varying scales, from monumental to intimate. For me, it’s a real luxury and indulgence to be able to make big paintings –– there’s so much room on the canvas to apply paint. That said, downshifting to making smaller work can be such a challenge, which I also appreciate. 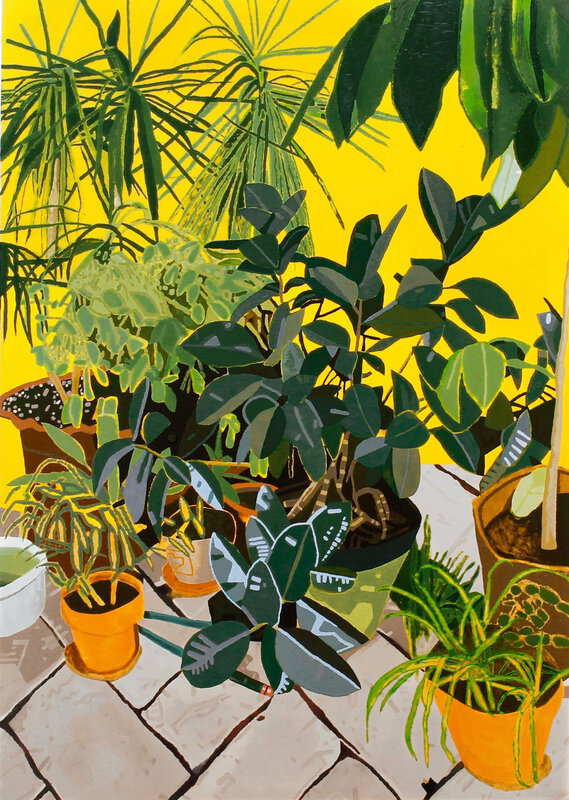 TB: Different subjects seem to make sense at certain scales: single, isolated objects should be small and approachable, still-life paintings work best at a near 1:1 ratio, and lush, environment paintings should be immersive and overwhelming. Having said that, I’m also very wary of my work becoming too prescribed or formulaic, and I always look for simple ways to challenge my default mode of working. TB: You’ve recently had a lot of opportunities including a residency at Villa Lena in Italy. What do you hope to take away from this experience? BK: I attempt to make the most of every opportunity, small or large, by challenging myself to work harder and pushing my work further and further along. I used my first residency at 100 W Corsicana to work through a backlog of images I had saved up after the birth of my first child. I produced 20+ paintings in a month, but in a way it felt like I was just catching up rather than progressing. For my residency at Villa Lena, I’m planning to soak up as much new imagery, history and culture as possible by exploring the Tuscan countryside and re-engaging with drawing. The idea is to be out and about during the day gathering information — taking photos and making preliminary drawings — and return to the studio each night to produce something a little more purposeful. In the end I hope to make ton of drawings! I would also like to create a book or compile my output in some meaningful way.